You’ve got your date and dress ready, but do you know how you’ll style your hair for prom? Don’t sweat if you don’t because I’m here to hook you up! 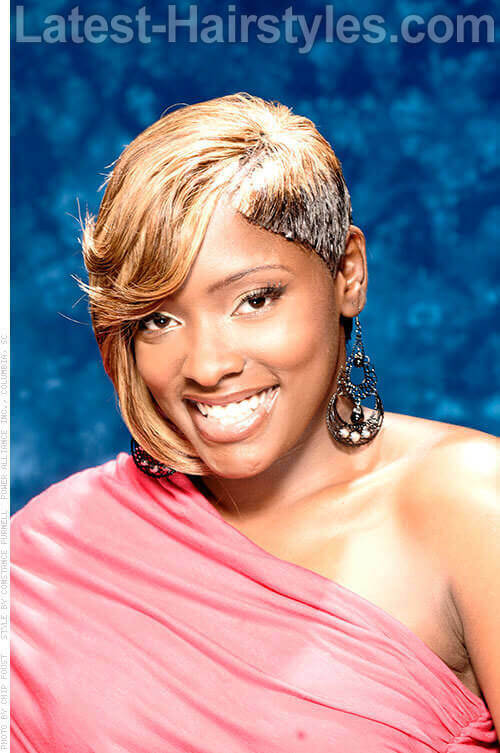 Check out these hot black prom hairstyles that will surely leave a lasting impression. This beautiful mess of an updo is fuss free and perfect for any prom queen. Section out bangs in the shape of a triangle. Curl bangs using a 1inch gold barrel curling iron. Curl the rest of the hair using a 2 inch barrel curling iron. Sweep hair up and pin into position. Try using the light hold spray from Global Keratin Juvexin Line to tame hair and give shine. This style fits any face shape. Medium to long hair is recommended for this style. Juvexin has a deep conditioner from its hair taming system that will keep your hair soft and manageable. Loose curls and a simple braid make for a perfect formal look. Part hair into 2 sections. Make one side bigger than the other. Part the larger section into 2 sections. Braid the 1st section. Tease and position the rest of the 2nd section. Sweep the rest of the hair to the side and put in ponytail. Curl the end of the ponytail. Spray hair using a light finishing spray. I recommend the KMS California brand. They carry a sea salt spray that gives a matte finish and tousled texture. Depending on the height one chooses for this style , it can suit most face shapes. Long hair is recommended for this hairdo. If you have frizzy hair and desire a sleeker finish try KMS California’s anti-humidity seal. This style features the ever classy and classic flat twisted bun. Section rectangle in the center of head. Flat twist this section into ponytail. Smooth rest of hair into ponytail. Use a 1 inch gold barrel curling iron to curl hair in ponytail. Spray sheen for a lasting shine. Since a lot of pomade or holding product may be used to achieve this style, using Matrix Biolage Detangling Solution afterwards will keep matting at bay. This style suits round faces and medium to long length hair. Use the Hydrating Shampoo from Matrix Biolage line. It contains aloe for moisturizing care. When in doubt, choose a chic high bun for stress free styling. Slick hair up in a ponytail using a molding gel. Pull ponytail through chignon. Wrap hair evenly around. Use additional hairbands and pins. Use pomade for smoothing and shine. L’Oreal Professional Paris carries Fix Move from its Tec Ni Art line. This gel gives a nice firm hold for your sleek bun. All face shapes work with this style. 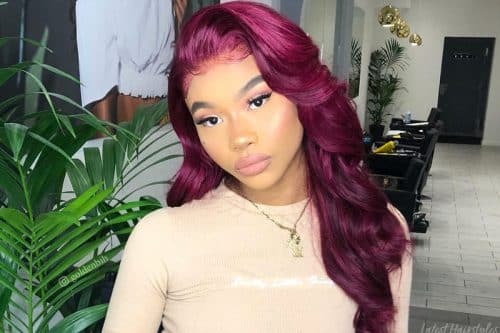 Curly or straight hair can work for this hairstyle. Use a chignon instead of your hair alone for the perfect bun shape. This style features long side bangs to enhance a regular bob style. Part hair on preferred side. Flat iron hair with a slight bend inwards on the ends. Use light sheen for shine. If you flat iron your hair often, Keratase Elixir Kultime Oleo-Complexe carries a versatile beautifying oil for all hair types. 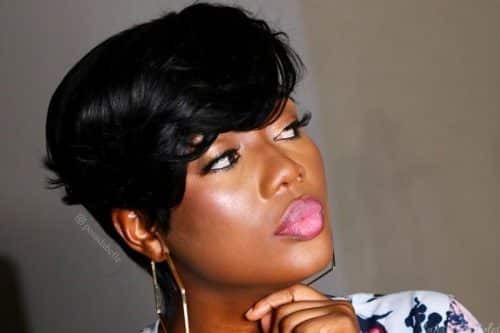 All face shapes with short to medium length hair are recommended for this style. 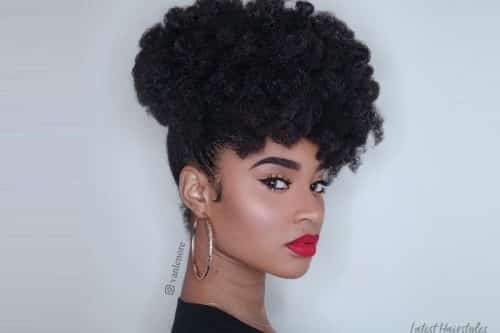 To keep from needing to flat iron every day wrap your hair in a beehive style and pin before sleeping. 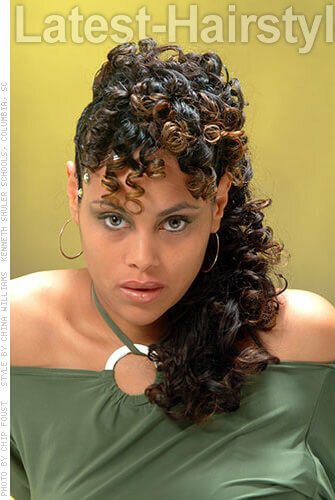 This style features a lovely curly mohawk suitable for any special occasion. Section out rectangle from forehead to nape. Curl hair in the middle using a 1-inch gold barrel curling iron. Smooth hair on the outer sections into middle. Pin hair into place. Use sheen for light shine. Use L’Oreal Professional Paris Liss Ultime as a smoothing treatment if you find your curls are unmanageable. All face shapes work with this style. Curly and straight hair are suitable. Use the L’oreal Professional Paris Liss Ultime Reflexium protecting serum to enhance the shine and bounce of your curls. 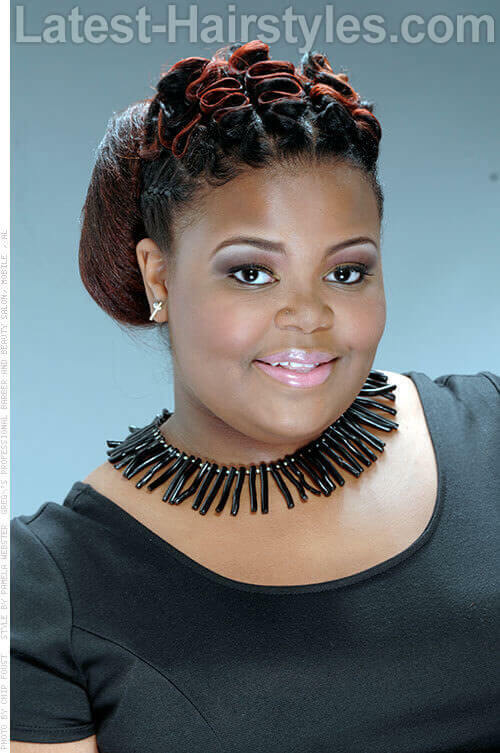 While cane row braids are known as a casual style, adding bouncy curls can easily transform it into a formal hairdo. Section hair into two. Make one side larger than the other. Braid cane rows in the larger section into a style similar to the photo. Curl the smaller section using a golden barrel curling iron. Use light spray as a finishing spray. Use light hold spray from Global Keratin Juvexin Line to tame hair and give shine. This style fits oval face shapes. Long, smooth hair is recommended. Use small black rubber bands to hold the cane row in place before curling the ends of the hair. This style features the trendy fishtail turned into an amazingingly elegant hairdo. Section hair into 3 horizontal sections. Smooth hair into 3 separate buns. Use loose extension hair to make a fish tail braid. Place and pin braid into Mohawk. Use Spritz for firm hold. Use Olive Oil pomade for smoothing the sides into place. Oval face shapes are recommended for this style. Medium to long lengths are best for this style. Pre-braid fishtail extension, spray and leave to dry before pinning into place. These stand up waves will leave the crowd in awe. Section out rectangle in the interior part of head. Part and mold hair into standing waves. Pin the ends into place. Form long bun with the rest of the hair. Use firm holding spray for a lasting hair style. Try Professional Sebastian Molding Mud, a fiber sculpture that will help keep your waves looking neat and intact. Round face shapes go well with this beautiful style. Medium to long smooth hair is recommended for this hairdo. For a fuller bun, wrap long loose extensions around the ponytail and pin into a bun. 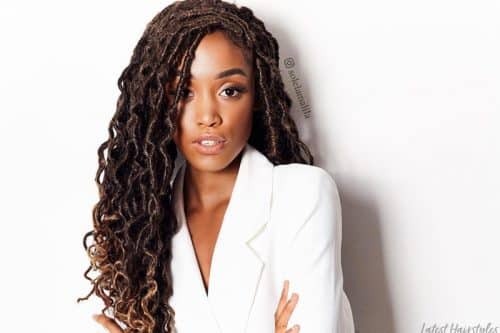 This style features wide crimped curls. Use wavy crimping iron for the entire head. Smooth front of hair and pin in place. Redkin 5th Ave NYC carries the Real Control Creme Care product that I recommend as a daily nourishing styling treatment for dry hair. This style suits any face shape and is recommended for smooth long hair. If you want to save you hair from dryness or if you just don’t own a crimping iron you can braid your hair into 4-5 cane rows and curl the ends with a curling iron for the same effect. 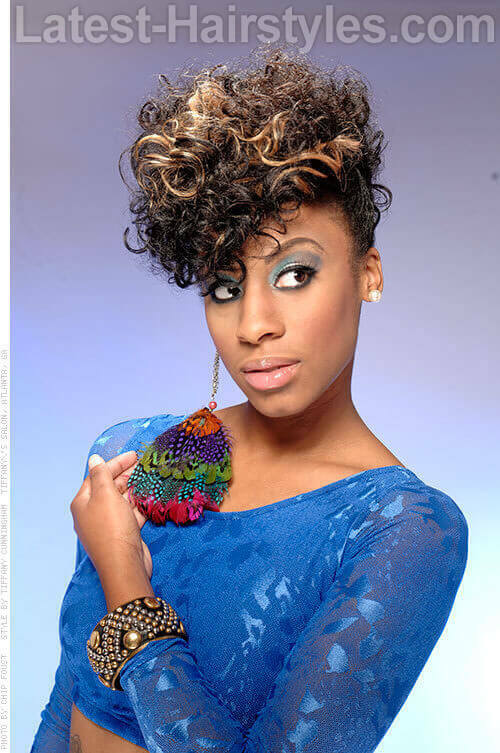 This style features honey blond highlights that enhance this simple mohawk. Use rollers or a 2 inch curling iron to curl hair. Tease curls for fuller looking curls. Smooth sides back for a mohawk effect. For healthy strands, I recommend Keratin Complex Smoothing Therapy, which is a color care conditioner that is sodium chloride free. All face shapes work with this style. Curly to straight hair is recommended. Try the Keratin Complex Vanilla Bean Deep Conditioner, which will have your hair looking and smelling sweet until your next wash.
Jazz up your bun with ringlets! Make slant part as desired. Smooth hair into high side ponytail. Wrap extensions around ponytail and pin into place. Leave some curls out for a different style. Use light spray for hold. For a sleek look try Sedu line’s anti-frizz polishing treatment. The best face shape for this style is oval. Medium to long hair is recommended for this style. To save some time, purchase extensions that are already curled. Install and pin in place for the same effect. 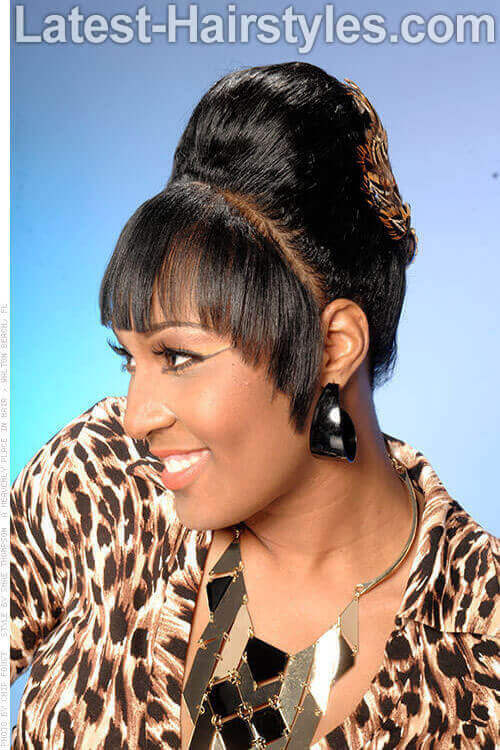 This style features a half bun with bangs for a definite crowd pleasing hairdo. Section out bangs. This style does not require any curl for the bangs. Tease hair and pin into half bun. Use extra firm holding spray. For breakage prone hair, use products from the Aphogee line. Any face shape can rock this style. This style suits medium to long smooth hair. Use hair accessories to enhance the style. 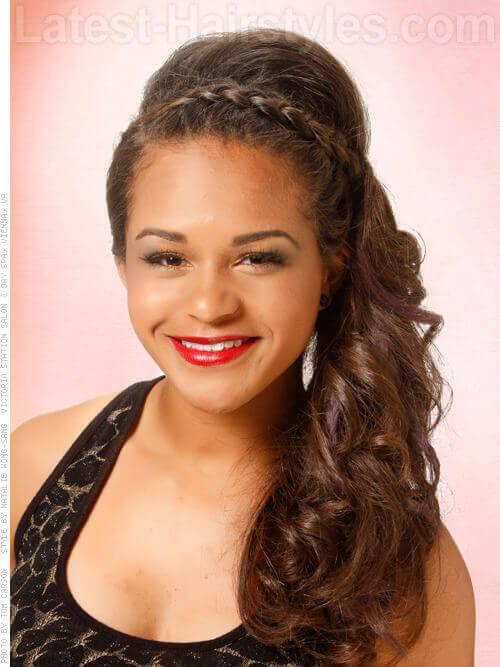 This style features a beautiful, intricate updo that is perfect for prom. Section out small rectangle for long side bangs. Section the rest of hair into 3 horizontal parts. In the top section, Part and pin hair into style. Smooth section 3 into low ponytail. Twist section 2 around ponytail and pin hair. Try Keratonics line which provides hair products containing silk for soft and beautiful hair. This style suits any face shape. Long smooth hair works well for this style. 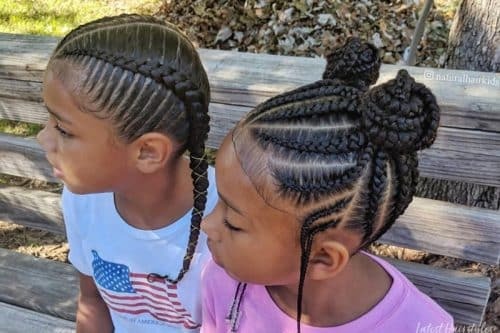 To keep hair healthy you can make this a protective style. Though short, this hairdo is 100% sophisticated! Smooth shorter hair down using pomade. Curl longer layers inward towards face. 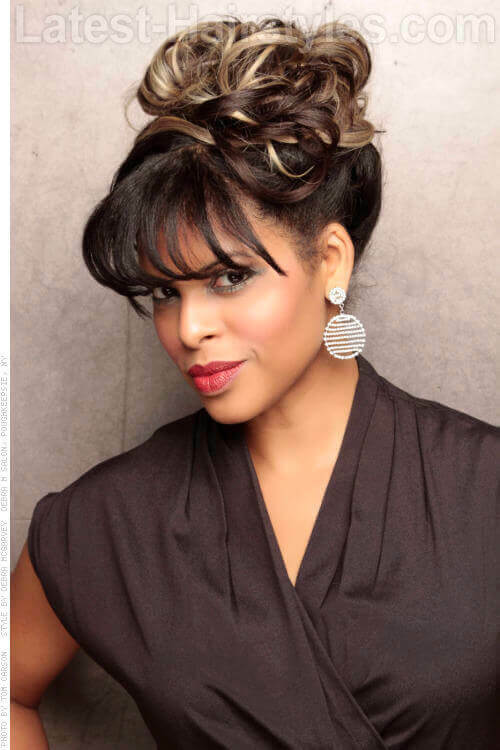 Curl shorter layers away from the face. Mizani H2O Intense strengthening night-time treatment will keep your short hair looking healthy. Oval face shapes work best with this style. 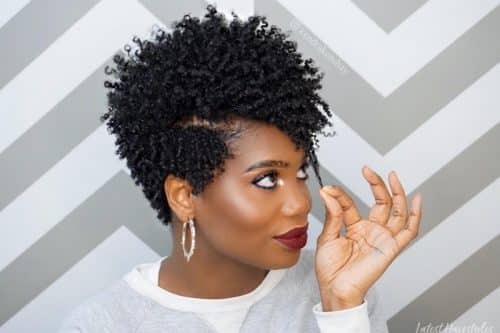 Short curly or smooth hair is recommended. Mizani’s Butter Rich deep nourishing treatment helps with frizz and keeping hair moisturized. You’ll be hot and ready to dance the night away with anyone of these black prom hairstyles!